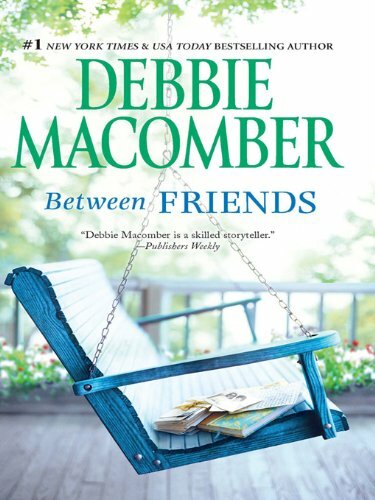 So our July book for our book club was Between Friends by Debbie Macomber. We decided that we needed something a bit uplifting, something that was pure fiction, perhaps with a romance thrown in. We have been meeting since February, and with the exception of Water for Elephants, we haven’t had good luck with our selections. So someone mentioned that Between Friends was on her to-read list. We found the book and decided that it was just what we were looking for. I went home and downloaded the book to my Kindle, and finished it in two days. This book is not written as a novel, so to speak. It is made up of a series of letters, telegrams, birth and death announcements, and eventually e-mails, centered around two women, who have been friends since the first grade, and remain close friends through their whole lives, through a series of ups and downs and marriages, children, sicknesses, re-locations, etc. The two main characters are Jillian and Lesley. Jillian comes from an upper class family, her father is a judge, and she never had to want for anything in her whole life. Lesley comes from a lower class family with an abusive alcoholic for a father and she grew up poor. The difference in classes never seems to make much difference to either girl. They are best friends, and that is that. They go throughout the various stages of her life, Lesley meeting and marrying a man very much like her father and seeming to suffer the same fate her mother did. Jillian went off to college, eventually to move to New York and follow in her father’s footsteps. I won’t give away the plot too much, but it is very interesting the way it was written as a series of letters, with current events written in to show you what part of history they were in at the time (elections, deaths, etc). I started reading and it took me a while to realize that the whole book was written that way and it wasn’t just the preface as books often have. An easy read, a quick one, and a great summer beach read. I really recommend it – she made me want to keep reading to see what was going to happen. Through these letters she made me genuinely like each character, and care about where their lives went. Overall 4/5 stars. I am interested in checking out the many more titles from this author. The book for June for my book club, the “Book Mistresses” was “Here We Go Again” by Betty White. I have long been a very big fan of Betty White, having mostly known her for her role as Rose Nylund in The Golden Girls. This book had some personal details surrounding her life, including her three marriages, two divorces, and the untimely death of her beloved Allen Ludden. It mostly though, centered around her career, which makes sense as it was plugged as her life in television. I found it interesting as she was basically around for the beginning of television, and has seen it evolve from a series of live, 10 minute programs, to what it is today. She has seen the rise and fall of the sitcom as well. As I said, I knew her mostly from The Golden Girls, so it was interesting for me to read about The Betty White Show (One through four) and her appearances on The Mary Tyler Moore Show and The Carol Burnett Show. There were lots of pictures to look at, which were interesting, but all in all, I didn’t find that I heard her voice come through in the story. It was there a bit, but it seemed more like Betty White telling a story as opposed to Betty White getting into the nitty gritty that is her life. I was also a bit disappointed as there was not as much about The Golden Girls as I expected there would be. Interesting, and if you’re a fan, worth reading. I gave it 3/5 stars. Honestly, who doesn’t love butter tarts? Many people are intimidated by the thought of making them, but they don’t have to be just something that you either pick up in a store or bakery, or something that Grandma used to make. This is a fairly simple recipe, and there really is nothing like homemade butter tarts. Give these a try and enjoy with a cup of tea in the afternoon. Delicious! 1/4 cup raisins, nuts, chocolate chips, whatever your preference. In a large bowl, combine flour with salt. With pastry blender or 2 knives, cut in butter and shortening until in fine crumbs. In 1 cup liquid measure, whisk egg yolk with vinegar, and add enough ice water to make 1/3 cup. Gradually sprinkle over flour mixture, stirring briskly with a fork until pastry holds together. Gather dough, press into disc. Wrap in plastic wrap and refrigerate for at least one hour or until chilled. For the filling: In a bowl, vigorously whisk together brown sugar, corn syrup, egg, butter, vanilla, vinegar and salt. Set aside. On a lightly floured surface, roll out pastry to 1/8 inch thickness. using a 4 inch round cookie cutter, or clean empty 28 oz can, cut out 12 circles, re-rolling scraps if necessary. Fit into 2 3/4 inch muffin cups. Divide raisins or nuts among pastry cups. Spoon in filling until 3/4 full. Bake in bottom third of 450 degree oven for about 12 minutes or until filling is puffed and bubbly and pastry is golden. Let stand on rack for one minute. To prevent sticking, immediately run a metal spatula around tarts to loosen. Carefully slide spatula under tarts and transfer to rack to let cool. If you have a pastry recipe that you prefer to use that is different than this one, go ahead and use it. You can add whatever you like to the filling. A handful of coconut might be good as well. Or mini M&M’s for the kids. This was another one that my mom made a lot growing up, because it was quick and easy. This recipe calls for ham, but you could also use chicken, leftover turkey, whatever you like and have on hand. If we had ham on the weekend though, you could pretty much bet that we would have this dish one night through the week. It’s still a family favourite. 1 cup leftover ham, cut up – or more. 1 large + one small can (or 3 small) cream of mushroom soup. 1 can sliced mushrooms, drained, or 1 lb fresh mushrooms, sliced and sauteed until tender. 1 package Extra Broad Egg Noodles (I prefer regular to no-yolk for this recipe) cooked and drained. In a large casserole dish or roasting pan with a lid or a dutch oven, combine all ingredients until well incorporated. Sprinkle a bit more Parmesan cheese on top. Cover and bake for 15-20 minutes. Remove cover and allow to bake until hot and bubbly, and the cheese on top begins to brown slightly. This is great with a salad and a slice of crusty bread or garlic bread. Being a pasta dish and fairly neutral, it lends itself to many additions. You could add several kinds of veggies to this – if you saute your mushrooms, you could do onions at the same time and throw them in. Chopped red peppers would be a nice addition. Par boiled broccoli florets could be added as well. You’re only limited to the scope of your imagination. Meatloaf is a funny thing. I find most people either really love meatloaf, or it makes them shiver from the memory of having to force it down as a child. The reality is, that a good meatloaf recipe is very useful to have on hand. It often contains ingredients that we keep on hand in our pantry or refrigerator, and is a wonderful comfort food meal on a blustery winter day. I know it’s summer, but I make it quite often on a day that is too rainy for grilling. This is a combination of the meatloaf recipe that I grew up with, combined with a few things I’ve picked up along the way. I have no measurements to give you, so I’ll try my best to guess as close as possible. The best thing to do with meatloaf is to try it, and then add your own personal touches. 1 – 1 1/2 lbs lean ground beef – it really doesn’t matter how much you use as this will not have to fit in a loaf pan. If you’ve got an army to feed, use as much as you like and adjust the other ingredients accordingly. 2 slices white bread, put to soak in milk – just put the bread in a bowl and cover them with milk. In a large bowl, combine meat with all ingredients. Add the bread, but not the milk. Mix together with your hands, making sure that the bread is broken up and all ingredients are evenly distributed throughout the meat. Don’t overwork the mixture, or it will toughen. If you feel it needs more moisture, you can add some of the reserved milk. Line a rimmed baking sheet with foil. Transfer meat mixture to baking sheet and form into an even log shape. Mix together ingredients for glaze and cover loaf completely. Bake for an hour to an hour and a half, depending on the size of the loaf. Remove from oven and allow to rest for 10 minutes or so. Best served with potatoes – scalloped or mashed. Garlic mashed is even better. There are so many variations you can do with this. You can use different kinds of meat, a mixture of beef and pork, ground chicken, sausage meat mixed in, the possibilities are endless. I once saw Tyler Florence drape strips of bacon over his meatloaf, which would add amazing flavour, and prevent drying out. If you want to go Italian style, omit the ketchup and add some of your favourite pasta sauce, bump up the Parmesan cheese, and add some Italian seasonings. You could go southwest style and add salsa and some Cheddar cheese to the mix, using salsa as the glaze as well. Ground turkey or chicken would be amazing with some smoky cumin or curry powder mixed in. To kick it up a notch, fry up some onions and mushrooms until they’re caramelized and throw them in. Or serve with them drizzled on top. So if you aren’t sure if you like meatloaf, give it a chance. Start out with a basic recipe like this one and go from there, developing it based on your tastes. There is no right or wrong! Enjoy! If you have any suggestions, please feel free to post them in the comments.